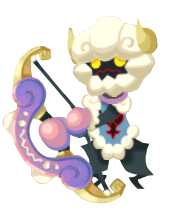 The Sleep Archer is a Heartless that appeared in Kingdom Hearts Union χ. This Heartless attacks by loading itself in its bow and firing itself at its victim, which promptly puts the victim to sleep. It attacks frequently, retaliating for every two attacks it suffers.